DSE hosts more than 40 races per year! Please note that our races are always subject to change throughout the year; please confirm race details the week prior on the race web-page. DSE Track Workout @ Kezar Stadium Track (north side). $3 for DSE members. $5 for non members. Run northbound from sidewalk onto Great Highway pedestrian path and run eastbound. Turnaround prior to Lincoln Way and return to finish. Run eastbound on Kennedy Drive, left onto East Conservatory Drive, complete East Conservatory Drive loop, then left back onto Kennedy Drive to McLaren Lodge. Turnaround at Kezar Drive Barricade, start back and turn left onto Bowling Green, right onto Nancy Pelosi Drive and right onto MLK Drive. Exit MLK after passing northern end of Japanese Tea Garden Drive. Turn right onto adjacent south/north pedestrian path, then left back onto Kennedy Drive. Run westbound on Kennedy Drive past two 4-way “Stop” intersections, then left on Bernice Rogers Way, left on ML King Drive, left uphill on Middle Drive and left onto Overlook (path) to finish. COURSE DESCRIPTION: Run through parking lot, exit right along diagonal dirt path and left onto Marina Blvd. Run eastbound on Marina Blvd, and complete Marina Green rectangle (left at Webster Street par course, left onto Marina Green Drive, left on Scott Street and right onto Marina Blvd). Return same way to start. 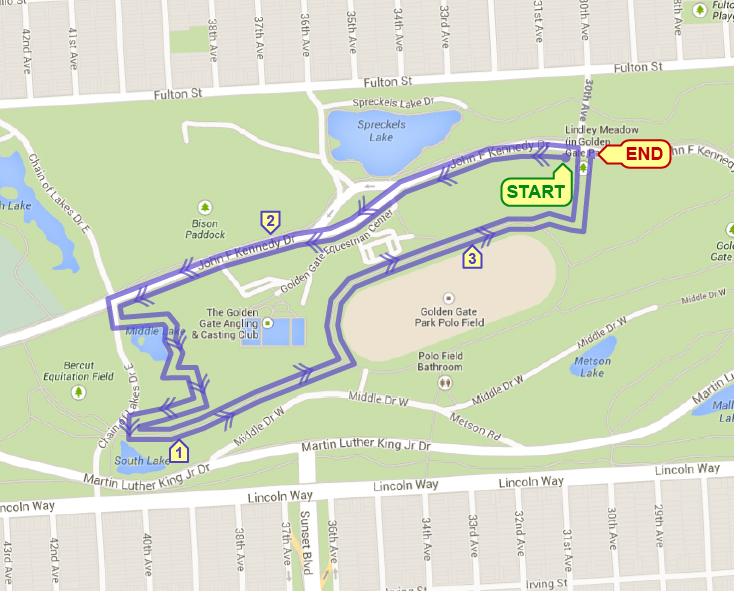 Run west along Crissy Field/GG Promenade; turn around at orange cone and return same way back to Little Marina Green. *Kids Run (1/2 mile) begins at 9:45 AM – Same Start/Finish location as adult race. DSE will be taking a break to allow runners to participate in San Francisco’s iconic Bay to Breakers! 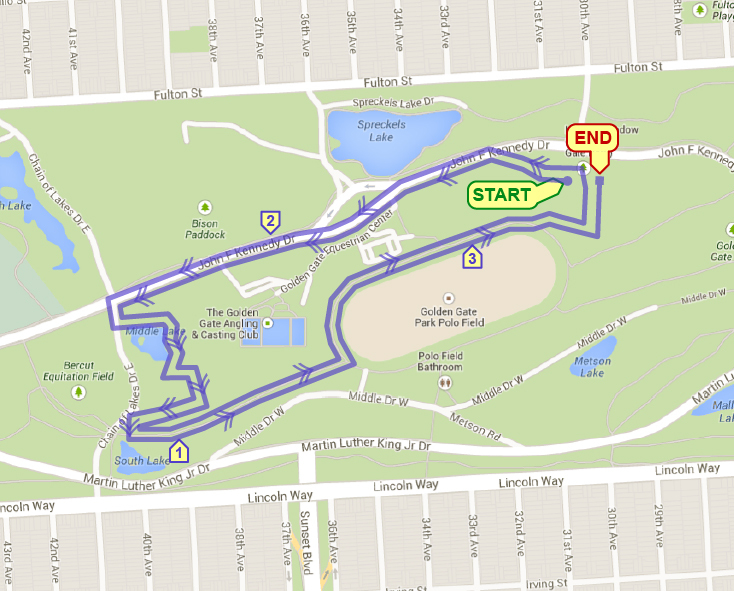 Double 1.55-mile XC counter-clockwise loop traversing grass, dirt and trails. From grass lawn, run uphill (north) onto upper trail of Kennedy Drive. Continue west on Kennedy Drive then left (southbound) onto Chain of Lakes Drive. Run approximately 50 yards and take left fork trail adjacent to mini pond. Traverse trail/sand/pavement/grass terrain to midway of Polo Field, then left downhill (north) back to Lindley Meadow grass lawn finish. 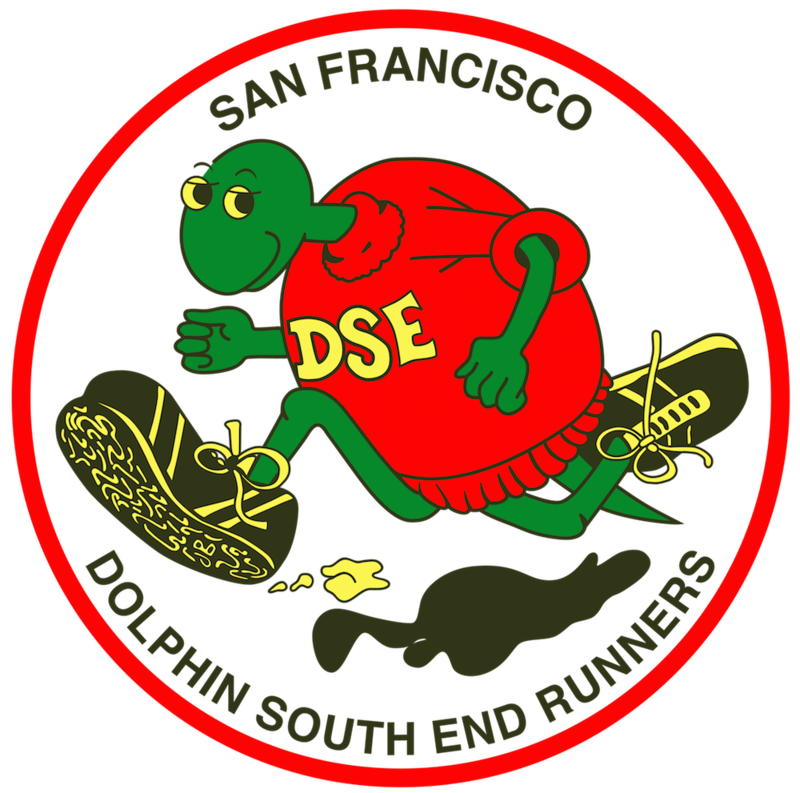 DSE will be taking a break to allow runners to enter the Statuto Race in the North Beach area of San Francisco. Challenging 4 mile loop around Twin Peaks with spectacular views. Complete inside reservoir counter-clockwise loop; exit downhill onto Clarendon, left onto Laguna Honda and run uphill to Woodside Ave. Continue up Woodside Ave past the gas station. 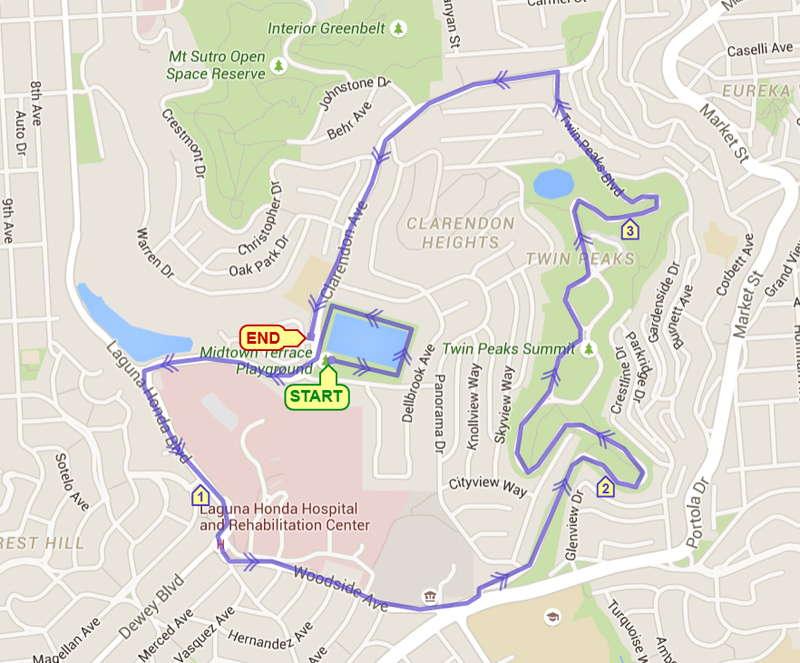 Run uphill/downhill on Twin Peaks Blvd then left and run uphill/downhill on Clarendon and finish inside reservoir.